Coming March 5, 2019. It’s a flippin’ race…as long as the flippin’ is pancakes at the International Pancake Race! 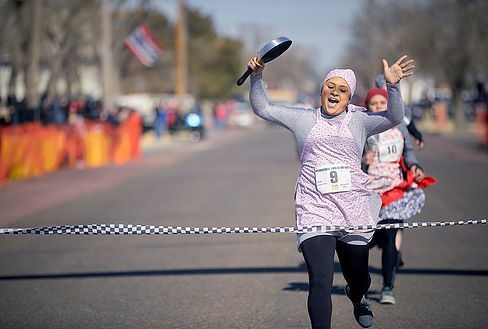 The friendly competition is between the women of Liberal, Kansas and those of Olney, Buckinghamshire, England in which the women in each community don scarves and aprons then run 415 yards, flipping a pancake in a frying pan. This year marks the 70th anniversary of this unique race with the current stats at 38 wins for Liberal and 29 for Olney. The story behind this dates back to 1445, when a woman in Olney, England was making pancakes. The church bells began ringing to announce the service, so she grabbed her head scarf and frying pan with the pancakes still cooking and raced to arrive at church on time. In subsequent years, others in the community joined in the race. Someone in Liberal, Kansas learned about the Olney race and proposed a friendly competition, and it’s been a tradition ever since. Having expanded to a four day event, there are pancake eating and flipping contests, a parade, a 5K fun run, and a talent show. Who’s up for pancakes? !